So, although I am a housewife, I'm a pretty lazy housewife, and the husband will attest to that. Therefore, being a lazy housewife, I'm all about quick, easy and semi-nutritious dinners. I'm a pretty decent cook, and have only had a couple of kitchen experiments that have gone horribly wrong. By and large, most of what I make is relatively tasty, and the husband is happy with my cooking. Last night I made one of our favorite dishes - mine because it's yummy and easy, his because...well, it's yummy! Prepare the pasta as instructed on the box. I start off with the pasta since it takes a while for it to cook. Next, in a large skillet, pour a tablespoon or so of Extra Virgin Olive Oil (EVOO), enough to thinly coat the bottom, and sprinkle in a little sea salt for flavoring. Add the baby spinach and begin to sauté on medium heat. While the spinach is sautéing, pour another tablespoon of EVOO in a medium skillet (again, enough to thinly coat the bottom) and add the shrimp (make sure you drain it first) with your choice of seasonings, my favorite combo being a little sea salt/garlic mix, cilantro, and crushed red pepper for a little heat. Sauté the shrimp over medium heat for a few minutes. Since the shrimp is already cooked, you just want to heat it in the seasonings. Make sure to occasionally stir the spinach to cook the stuff on top. You'll know it's done when it all looks wilted. Once the spinach is done, drain the shrimp (it'll get juicy as it cooks), add the shrimp to the spinach, and add the jar of Rosé Cream Sauce to the mixture, continuing to warm over low to medium heat. Once the sauce is bubbling, it's ready. Pour the mixture over pasta and enjoy! The wonderful thing about this recipe is that the combinations are endless. And adding veggies to the sauce mixture is an easy way to sneak them in. I've made this with broccoli and asparagus, as well, and both are equally delicious. As you can see in the photo above (click to enlarge), I added 12 oz. of roasted red peppers to it this time, and while it was really good, I found that the peppers overpowered even the sauce. I think next time I will just use a single red pepper and roast it myself. 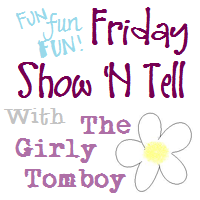 I shared this post with Bea over at ...The Girly Tomboy... Check her out and share your blog posts, too! That's a great recipe! I never think to put spinach on pasta, but it's such a fast way to up the veggie quotient.